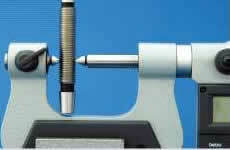 Screw thread micrometer can be used for measuring pitch diameter. 60°or 55° V-shaped and knife-edged anvils(interchangeable) are optional.Dimension of anvil-tail: Ø5X15mm. • Painted frame for Type-A; Chrome-plated frame for Type-B. • Resolution: 001mm / 0.001". 1" thread pitch micrometer, 2" thread pitch micrometer, 3" thread pitch micrometer, 4" thread pitch micrometer, 5" thread pitch micrometer. . .